Atten-Hut! These ladies are the best of the best--and will take you down if you threaten their Captain.<br />Welcome to Hala Field, where being a part of the elite Carol Corps, requires guts, guile and a whole lot of grit. 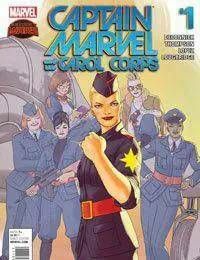 So put on your uniform and get ready for a high-flying Captain Marvel series years in the making. Marvel Super Hero Adventures: Captain Marvel - First Day of School!